The renovation of sports arena in Yekaterinburg has been officially completed, the developer Sinara Group announced today. 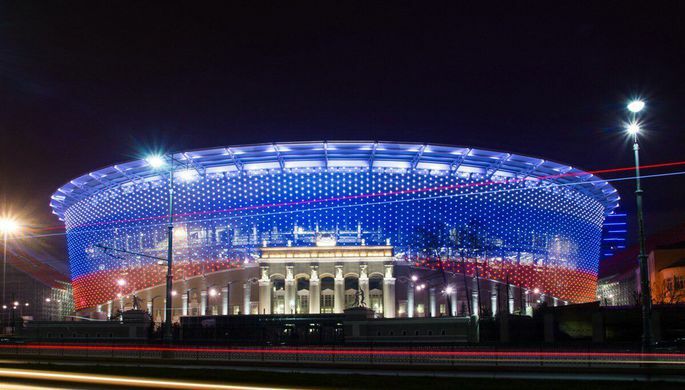 According to the company’s CEO Timur Ufimtsev, the reconstruction did not affect the stadium’s historical shapes and overall image while upgrading the arena to the modern international standards. The cost of the site reconstruction amount to 13 bln rubles ($240 mln). The Yekaterinburg-Arena’s capacity is 35,000 seats. The original stadium was erected in 1950s and it is listed as regional historical and culture heritage site. The first game in the newly renovated arena has been scheduled for April 1, when Rubin club will face Ural. Yekaterinburg is one of 12 Russian host cities of the FIFA World Cup-2018 kicking off in June 2018. Be the first to comment on "New Arena Ready for Kick-Off"